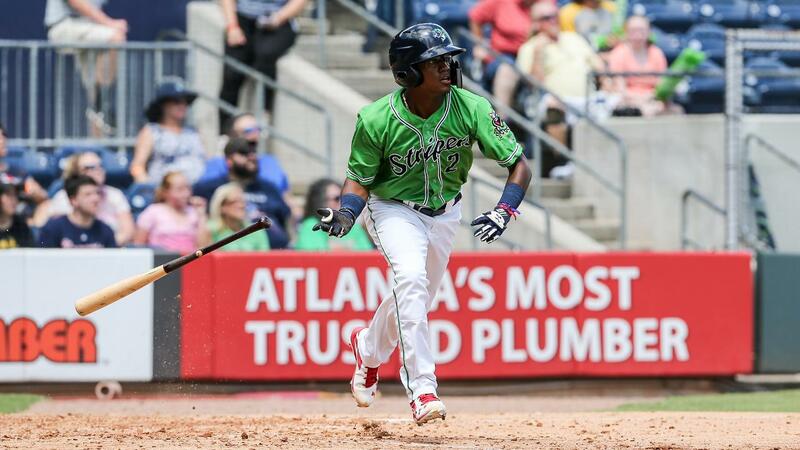 LAWRENCEVILLE, Ga. - The first season of Gwinnett Stripers baseball came to a close Monday with a 6-1 loss to the Charlotte Knights at Coolray Field. Left-hander Corbin Clouse got the start for Gwinnett and was welcomed with back-to-back singles by Charlie Tilson and Jake Elmore to start the game. Clouse got out of trouble, however, retiring the next three batters. He finished after 3.0 scoreless innings, allowing three hits with a strikeout. The Stripers got on the board first after Alex Jackson led off the third with a double and moved to third on Nicholas Shumpert's first career Triple-A hit. Luis Marte grounded out, bringing Jackson home for a 1-0 lead against right-hander Jordan Stephens. Arodys Vizcaino and Jose Ramirez, both on rehab assignments from Atlanta, threw successive 1.0-inning scoreless frames. Kelvin Vasquez made his Triple-A debut in the sixth, throwing eight of nine pitches for strikes with one punch-out in a scoreless inning. The game unraveled in the seventh for Gwinnett and lefty Philip Pfeifer. After retiring the first two batters, a pitch got away from Pfeifer and hit Bryant Flete in the face. Pfeifer lost command after that, walking the next three batters, including Tilson for the game-tying RBI. Chase Whitley came on to relieve Pfeifer, but couldn't prevent more damage. He walked the first batter he faced - Elmore - to give Charlotte the lead. Patrick Leonard then cracked a bases-clearing double, opening up the score to 5-1. Charlotte tacked on another run in the eighth on an RBI single by Flete. Pfeifer (L, 2-3) was tagged for four runs and three walks in 0.2 innings. Whitley gave up two runs on four hits over 1.1 innings. Stephens (W, 4-7) allowed the one run on five hits over 6.0 innings, striking out five. Jhoan Quijada, Tyler Watson and Gregory Infante each threw scoreless innings to close out the game. Of note, Yuta Okazaki, a former independent leagues player who signed his first professional contract with Atlanta this year, picked up his first career hit in the ninth inning off Infante. Austin Riley finished his campaign with a 2-for-4 effort, bringing his season batting average to .282 with the Stripers and .294 overall between Gwinnett and Double-A Mississippi. He ended with 19 total home runs, falling one short of making it three consecutive 20-homer seasons. Elmore was 2-for-4 with a walk, an RBI and a run scored for Charlotte. The Stripers ended the season 70-69 to finish second to the Durham Bulls in the International League South. It marks the club's first record above .500 since 2015, when Gwinnett went 77-67 and also finished second in the South division. The 2019 season begins Thursday, April 4 with a 7:05 p.m. game against the Norfolk Tides.